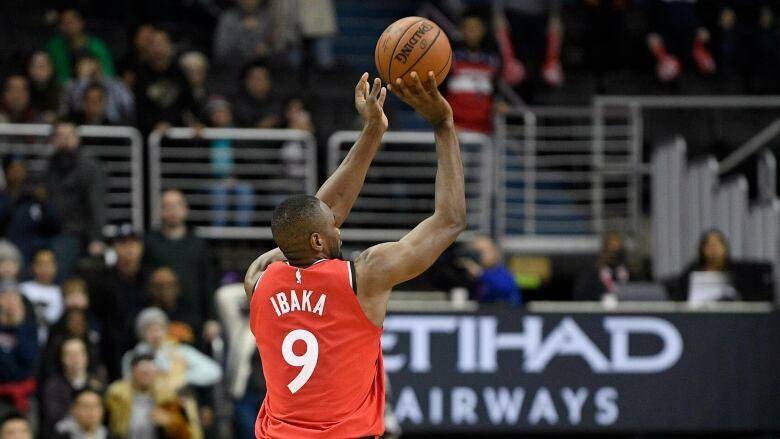 Serge Ibaka hit a 3-pointer with 15 seconds left in the second overtime, and the Toronto Raptors survived to earn their fifth straight win, 140-138 over the Washington Wizards on Sunday. Toronto blows 23-point lead in matinee, but holds on in D.C. The Toronto Raptors began with a rush. They scored the first nine points against the Washington Wizards, built a 19-point lead in the first quarter and went ahead by 23 in the second quarter. Near the end of the third quarter, Toronto still led by 17 points. Then Washington got hot and forced one overtime and then another. Serge Ibaka's 3-pointer with 15 seconds left in the second overtime allowed the Raptors to survive and earn their fifth straight win, 140-138 over the Wizards on Sunday. "It shouldn't come down to the last possession," Kawhi Leonard said. "We need to close out games better." Leonard, who played a season-high 45 minutes, led Toronto with 41 points and 11 rebounds. "Tonight he played like a superstar," Ibaka said. "That's how we need him to play and he did his job as a superstar. When we need him to step up and make big plays, he did them for us." Bradley Beal had his second triple-double of the season, collecting season highs of 43 points and 15 assists along with 10 rebounds. His 3-pointer with 20.4 seconds left in regulation tied it at 124 to force overtime. His jumper with 6.8 seconds to play in the first overtime tied it at 131. Beal joined Oscar Robertson as the only players in NBA history with multiple games of 40 points, 15 assists and 10 rebounds in a season. Robertson had three such games in 1961-62. He didn't have much to say about it, though, leaving the locker room before it opened to the media as the Wizards scrambled to make a flight to London for its next game. Washington never led until early in the second overtime. Leonard had 13 straight points in the fourth quarter and overtime. Toronto missed seven of nine from the field in the second OT and didn't score for nearly 3 1/2 minutes, but Washington could only push ahead by three points during that stretch.